With the advent of glueless floating hardwood engineered flooring you can lay a hardwood floor anywhere. You no longer have to avoid the kitchen, bath or laundry rooms. Concern about the pipes for in-floor radiant heat isn’t necessary. What a great way to put an elegant looking floor in your home or office without the expense. Many homeowners enjoy doing their own projects around the house, because it is a less expensive way to update your home and it can give quite a bit of pride and satisfaction in seeing a job well done. DIY projects also give you a chance to choose the materials you want and that fit your budget, your needs, and your decorating style. Flooring choices abound in material choices, which can be quite overwhelming, but it also gives you the opportunity to make your home into the showplace that you want and need. One type of flooring that you will want to consider for your home is glueless floating hardwood engineered flooring. What can it offer your home? Beauty. The beauty of engineered flooring ranks right up there with hardwood flooring choices. It comes in many different wood varieties, including bamboo, oak, beech, and even some exotic woods to enable you to find the exact right look for your home or room. It offers you a top layer of real hardwood with under layers of medium density fiberboard or other material that makes the flooring very durable. Ease of care. Glueless floating hardwood engineered flooring is easy to take care of, too. Simply damp mopping it can keep it looking beautiful for a long time to make the most of your investment. It holds up well to moisture-prone areas like the kitchen, basement, and bathroom without buckling and warping, too, which is an excellent benefit. This is due to the floating aspect of the flooring, because it can contract and expand without any problem or noticeable effects upon the flooring. High traffic areas are no problem for engineered flooring, because they are made to be highly durable and able to withstand the wear and tear that you can throw at them. Ease of installation. The glueless floating hardwood engineered flooring is simple to install, too. All you have to do is lay down a moisture barrier, which is either a foam-like material or black plastic, place the flooring pieces, clicking and locking them into place. No glue or nails are needed, because the flooring pieces connect to each other making a large whole. Some cuts will need to be made, but if you plan carefully, you can keep the cuts to a minimum. Be sure that you purchase quality glueless floating hardwood engineered flooring. Cheaper is not better in most flooring varieties. 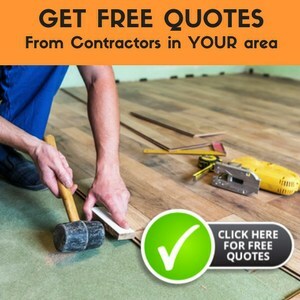 Choose a middle of the price range brand that is backed by some type of warranty to ensure that you are getting high quality flooring that will last you for years. This is important to make the most of your budget and the time that you spend installing the flooring. Glueless floating hardwood engineered flooring can help to make your home feel warmer and more updated. Finding the right wood variety for your home’s style and intended design is very important to increase your satisfaction level and your level of pride of ownership. You will be amazed at what a difference a change of flooring can make in the entire look and feel of your home. In no time at all, you could create a feeling of newness and warmth in your home that will be inviting and welcoming to you, your family, and your friends. I WAS TOLD NOT TO MOP FLOATING HARDWOODS BECAUSE IT WILL CAUSE THE FLOOR TO BUCKLE. IS THIS CORRECT. HOW DO YOU CARE FOR FLOATING HARDWOODS? IS THERE A HARDWOODFLOOR OUT THERE THAT WILL MESS UP DUE TO MOPPING? Yep, never wet mop hardwoods – just for the reason you mentioned. Damp mopping is ok – with a microfiber mop is even better. I personally suggest people avoid Swiffers because of the environmental ramifications like the disposable mop heads and the use of toxic chemicals. A dilute vinegar water solution with a microfiber mophead or rag will clean your floors right up. I need to remove my floating engineered floor, but I want to re-use the boards. Any suggestions?